As neuroscience enters the era of big databases, a new approach could offer a deeper and more systematic understanding of brain function. HBP scientists put forward the argument in an article in the current issue of the renowned journal Trends in Cognitive Science. To uncover connections between brain regions and specific cognitive functions, neuroscientists have long made extensive use of techniques like functional resonance imaging (fMRI). First introduced in the 1990’s, the method allows tracking the brain’s activity while a test subject performs a task or responds to stimuli in the MRI scanner. To date, fMRI has been employed in thousands of studies to determine the "locations" of a wide variety of behavioral functions in the brain. In spite of this, it has proved difficult to understand specific functions and complex interaction of brain areas and networks. For regions like the hippocampus, long lists of associated tasks have been described, but so far, the many individual results have not produced a conclusive picture. 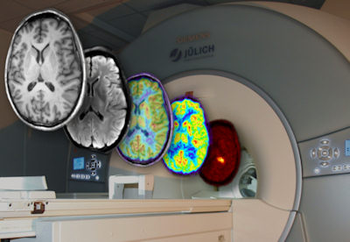 “By now many different conditions have been tested in many different people and large databases make the compiled data of tens of thousands of different imaging studies available”, says senior author Simon Eickhoff, head of the area of Brain and Behaviour at the Institute of Neuroscience and Medicine at Forschungszentrum Jülich and the Institute of Systems Neuroscience at University Clinic Düsseldorf. In addition, extensive population samples have been collected by initiatives like the Human Connectome Project, the UK Biobank or the German 1000Brain study, which combine functional and anatomical brain data with anonymized results in various cognitive tests. With the data from many studies one can begin identifying the basic sub-functions that are dynamically combined into more complex behaviors. “Basically we can now approach the middle level. This has been somewhat in the dark, compared to what is known from measurements about the microscopic level, like the neurophysiology of cells, and the higher functions of complex behavior.” This focus of bridging between the different levels of brain organization is very much in line with the broader goals of the Human Brain Project, Eickhoff explains. With around 500 contributing scientists all over Europe, the project aims to set up a framework to understand the brain’s complexity in a more unified way. The work in functional mapping will be integrated into a web-based 3D-Atlas that can be zoomed through all scales and reflects many different aspects, from genetics, cells and networks all the way up to a regions behavioral involvements. HBP-Blog Brain Byte: What does this part of brain do? Sarah Genon writes about how a change in perspective, and large data-banks, could help us to understand the brain’s functions.